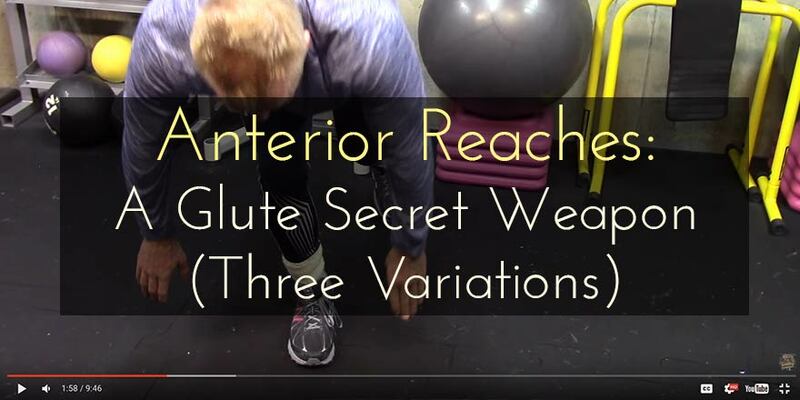 Anterior Reaches as a glute secret weapon: It's about nuance and subtlety, not just "more resistance"! Today’s blog post is half a blog, half an exercise demonstration, because I want to make a point about subtlety and nuance, and give some insight into improving a physique without just using the “kitchen sink” approach of throwing more and more resistance exercises at a trainee. Sometimes finesse and nuance are what is called for. 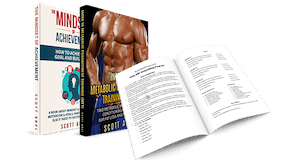 This is where muscle “engagement” makes better sense than pure muscle overload. If you’re looking to improve your glutes (for example), you can’t always just add more and more resistance exercises, or exercises with too much metabolic demands. But the anterior reach is good to include in a warm up to better engage your glutes for the exercises that come later (they can be done in a cool down segment as well – that is when I often do them). Today at the gym for instance, there was a young lady in great shape. She was doing barbell hip thrusts. This is an exercise I have no use for at all. By the time she kept loading the bar and sliding under it, she would have been better off doing repeated sets of simple anterior reaches, including both two hand, ipsilateral, and contralateral. Her program wasn’t taking into account muscle “engagement” over “muscle overload.” In my opinion, she was not optimizing her gym time. Basic Anterior Reach: Two hands reach down to whatever leg you’re standing on. Ipsilateral Anterior Reach (Ipsilateral meaning same side): If standing on your right leg, reach with your right hand, and if standing on your left leg, reach with your left hand. Contralateral Anterior Reach (“contra” meaning opposite side) – if standing on left leg, reach your toes with right hand, and if standing on right leg, reach your toes with your left hand. The anterior reach, done properly, facilitates proprioceptive demand. Proprioception just has to do with feeling and understanding your body’s movement and balance. When you move your fingers in the air, even if you’re not touching anything, you “know” you’re doing it. This is proprioception. Balance exercises like anterior reaches help with proprioception. 1. Deep longitudinal system: this just means the base of the foot all the way up the back of the leg, into the hamstring, the glute, and the lower back. 2. The Lateral System: you’re creating a side-to-side balance and counter-balance demand. A digression is a way to make an exercise easier. This is especially important if you’re just starting an exercise or if you aren’t very good at it, or your muscles in that kinetic chain are too weak or uncoordinated for full exercise expression, or you’re just starting a new program that you haven’t adapted to yet. 1. Just use less range of motion, or a “short” amount of range of motion. After my back surgery way back in 2000 , part of my rehab was anterior reaches with very short ranges of motion. I just increased the range of motion over time. 2. Enhance stability in some way. Have a bench or stability ball there if you need it (see the video). Do it next to a cage at the gym, or near a bench, and when you need to reach out for balance, do so! or glute looks like in motion. How do you do a glute exercise with no glute involved? There was no form to model. When you first introduced these into my program, I thought, ‘oh these are easy’. But wow, they truly do work in an unusual way. But focussing in is really necessary, to work it right. Thanks coach! Scott, I love the simplicity of this. Would you please explain further why not to use the counterbalance of the leg in the air? Scott, I agree with Kevin…love the simplicity of taking a few extra moments before or after to add these to program. I do see girls at gym doing anterior reaches kicking leg high in the air also using weights. Is there any benefit to adding weight or is this another example of poor use of gym time?